She just turned 21. So perhaps the cruel truth can be at last be said about Dakota Fanning without fear of being called a child-abuser. Whatever “it” is, that spark that film actresses and actors have that makes them interesting and empathetic and anything else on the screen, Fanning doesn’t have it. Dead-eyed and expressionless, the once-wondrous child actress hasn’t matured into anyone worth building a movie around. 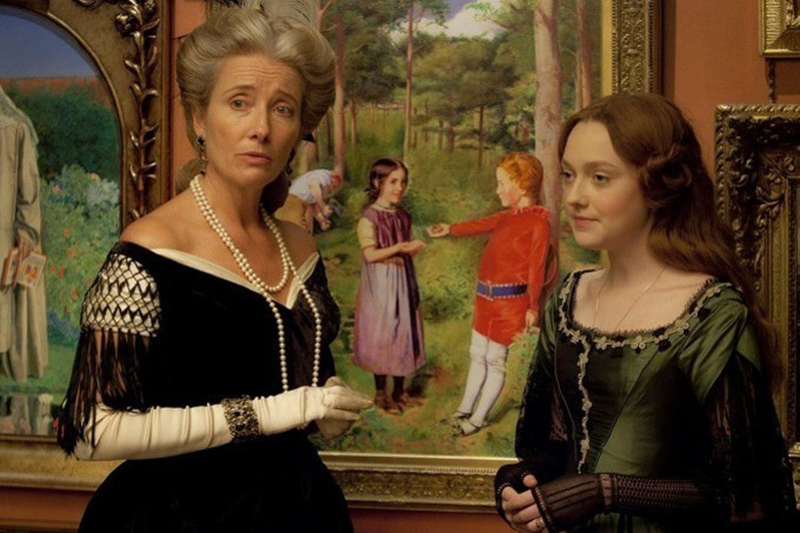 You can see it in the pained smiles of Emma Thompson, her co-star in “Effie Gray,” in which Fanning plays an ill-used child bride in the art world of Victorian Britain. Thompson wrote this vehicle, which co-stars her husband Greg Wise, and she’s not so great an actress that we can’t read “This dull child is absolutely ruining my wonderful period piece” in her performance. Euphemia ‘Effie’ Gray was the obsession of her much-older suitor, the artist, critic and “greatest (art) teacher of our time,” John Ruskin. She “loves” him and accepts his proposal and moves from Scotland to London with the great man. He was the first to recognize the genius of “Mr. Turner,” for those who caught that biopic of the famed pre-impressionist English landscape artist. But Ruskin was schooled for nothing less. When Effie moves in with her husband and his parents, she sees his passion is only for the work his exacting father (David Suchet) and smothering martinet mother (Julie Waters) have groomed him for. Ruskin has no time or interest, in ANY way, in Effie. And she’s not allowed to protest her lonely lot. Thompson plays the forward-thinking arts patron Lady Eastlake (James Fox plays her husband), a woman who recognizes neglect and fears for Effie’s health and future. Robbie Coltrane is a doctor, Derek Jacobi a lawyer. The supporting cast is impeccable. The problem begins and ends with Fanning. Effie is meant to be a hothouse flower, a “great beauty” who “blossoms” when a young protege (Tom Sturridge is painter Everett Millais) pays attention to her. Fanning cannot manage it. Her Effie’s sufferings have been lacking, and Effie’s romantic desperation is a non-starter. Fanning’s name still gets movies financed, after a fashion. But after this, the latest in a long series of film-killing performances, perhaps even producers will get a clue. If you can’t get Elle, no Fanning is better than any Fanning at all. Credits: Directed by Richard Laxton, written by Emma Thompson. An Adopt Films release.